Never pay expensive cable or satellite fees again! 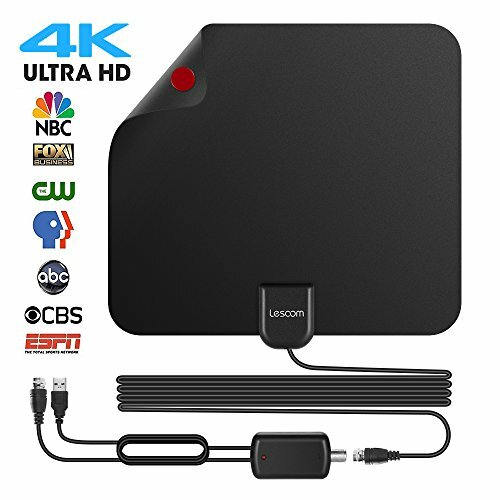 Our HDTV Antenna can get access to your local news, weather, sitcoms, kids and sports programs, including ABC, CBS, NBC, PBS, Fox, Univision and more. Absolutely FREE forever. Reception Range: 35 miles (60-80 miles with Amplifier) Generally, the Antenna should be keep far from disturbance source, air conditioner/refrigerator/microwave oven, etc. Antenna amplifier is included to provide added range and maximum signal reception for more channels if you are far away from broadcast towers. Importance: If a signal can’t be received with the external amplifier, remove the antenna amplifier and try again. Please first visit " antennaweb.org" to check how many broadcast towers surrounding you within 60-80 miles. Discover how many FREE CHANNELS are available from your local broadcasters. HDTV antenna pulls in hundreds of crystal clear digital & HD shows! Receives free HD channels including ABC, CBS, NBC, PBS, Fox, Univision and more. The super soft, unobtrusively thin design and powerful reception capabilities make this antenna a top choice for any home. 3. Strongly recommended without obstacles such as big trees, buildings or hills. Do not place the antenna in the basement or low-lying areas where the radio signal is very poor. 4.The actual receivable range may highly dependents on your distance and location. Areas with large obstructions such in valleys, mountains, etc. will reduce effective range. 5.Always re-scan channels after moving the indoor antenna, the result may be better. Upgraded Amplifier & 80 MILES Long Range - Reception Range: 35 miles (60-80 miles with Amplifier) Generally, the Antenna should be keep far from disturbance source, air conditioner/refrigerator/microwave oven, etc. Antenna amplifier is included to provide added range and maximum signal reception for more channels if you are far away from broadcast towers. Importance: If a signal can't be received with the external amplifier, remove the antenna amplifier and try again. Ultra-Thin & Easy To Use - TV Antenna light as a feather, allows you to place it almost anywhere and no power required. With the Unique Plastic Shell and Silver Slurry imported from the US, all the accessories are all pure copper to assure the contact loose. Digital HDTV antenna with 13ft coax cable, USB power adapter with spare cable, Amplifier Signal Booster, Spare 3M Sticker. Installation is a breeze with only 3 steps: unwrap, plug it and scan channels. Worry-Free 12 Month Warranty -- 3 months replacement and 1 year warranty , If you unfortunately get a defective one, please contact our customer service and we will give you replacement or refund. Lesoom is specialized in every product and service issues ,we are committed to providing a 5-Star shopping experience to all buyers!! !